Gas grilling is one of the mainstays of summer cooking. There is nothing quite like the taste of a freshly seared steak, ear of corn, or burger hot off the grill. As your local Dallas propane gas company, we at Northwest Propane Gas Company, strive to help homeowners to have an enjoyable grilling experience by offering these safety tips for outdoor gas grilling. Check the grill hoses for signs of wear or damage. Check burner tubes for insects, spiders and grease. Clean them if there’s any debris. Check for gas leaks. 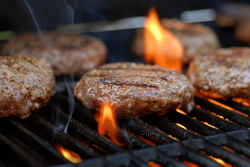 Do not light the grill if you hear or smell a propane leak. Do not grill in the garage, breezeway or any other enclosed or covered area. Grill at least ten feet away from any structure. Keep kids and pets away from the grill. To dogs, the smell of the meat might be enticing enough to tempt them to grab it and get burned or catch fire. Keep long hair away from the grill. The smell of burning hair is unpleasant and you may become injured. Keep long sleeves away from the grill’s flames. Double check that the gas is shut off before storing the grill. Allow the grill to cool off before putting it away or covering it. Do not store the grill or any extra propane tanks near gasoline or anything that is flammable. Store propane tanks in an upright position. Do not transport a full tank of propane in a hot enclosed space like a car trunk. The tank could explode as the gas expands from the heat. Using propane gas is an energy efficient, affordable and fun way to prepare summer meals. At Northwest Propane Gas Company, our team is proud to serve the community’s need for residential propane for grills and other needs. For more information on the safe use of propane for your summertime grilling, give us a call today at 800-274-6121.